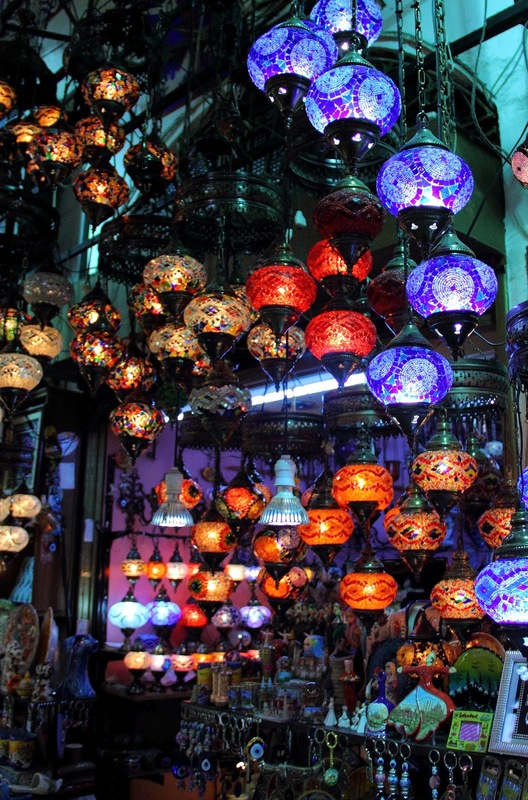 Ticking the Bucketlist » Istanbul: Time to shop! Shopping is every woman’s birth right! Istanbul gives you plenty of opportunities to use your birth right! Anywhere and everywhere is an opportunity to shop for something that will fondly remind you of your visit to Turkey… and make you want to visit the charming country once again! 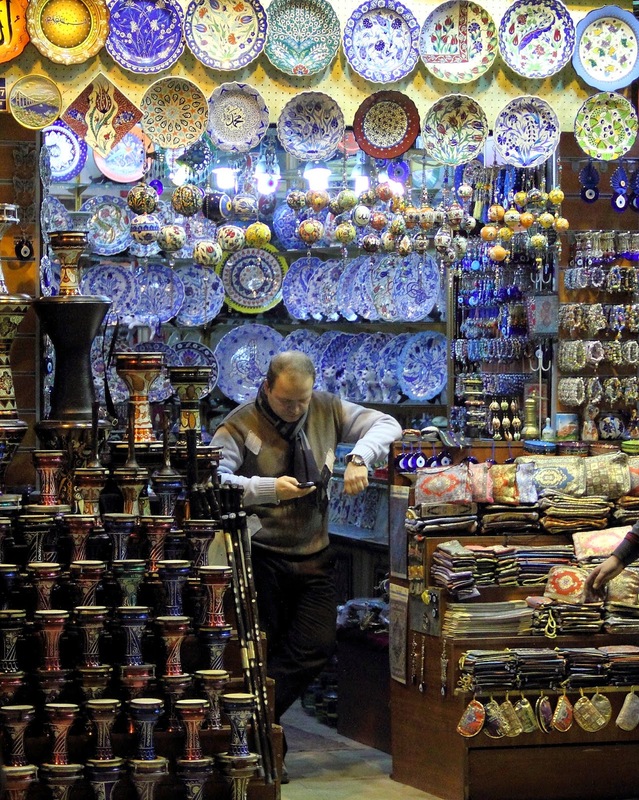 The Grand Bazaar and Spice Bazaar were amongst my best shopping experiences in Istanbul. If I had to choose any one location that represents Istanbul in its true form, it would be the Grand Bazaar. 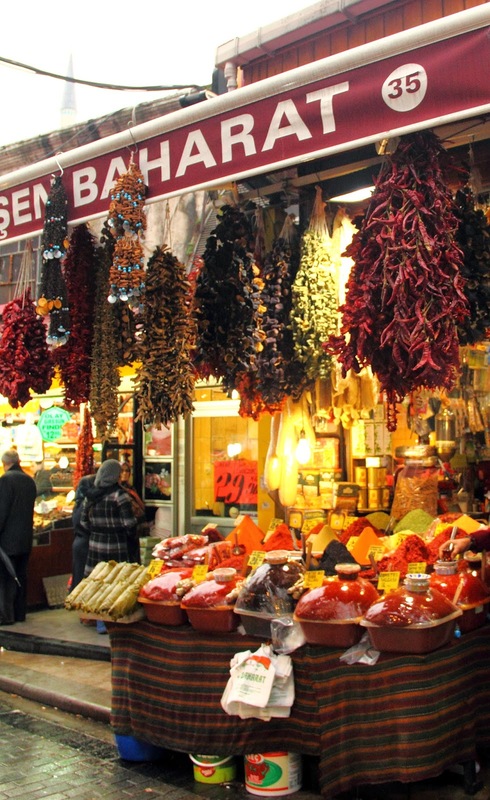 And if I had to choose one location that floods the senses – sights, sounds, aromas, it would be the Spice Bazaar! 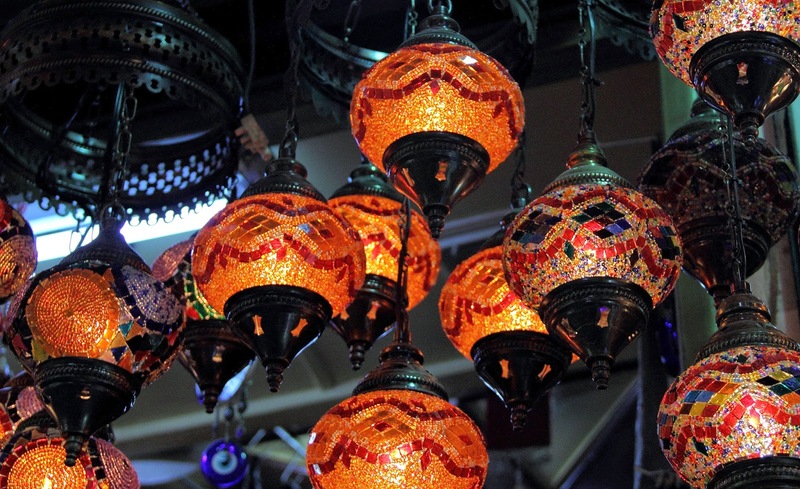 Grand Bazaar: More Turkish lamps! Turkish porcelain is a riot of colours. In the Grand Bazar, they all looked similar and seemed so expensive that I gave buying them a skip. I regret it! I will surely buy some on my next trip to Istanbul. Recommend buying at least a couple of bowls – everyone would want to know where you got them from! Magic Carpet: There were so many carpet merchants, each claiming that their product was authentic and handmade (and not mass produced in China). We really could not differentiate one from the other and each one seemed more expensive than the other….skipped buying one. We will buying our flying carpet when we visit Morocco! Souvenirs: Evil eye as a key ring, as a pendant or as a fridge magnet – its there everywhere! Shimmy like a belly dancer: Buy a glittering belt from a belly dance costume. I fancy the belts even more as I have learnt belly dancing for over 3 years! Turkish delight: The Istanbul airport welcomes you with mounds of Turkish delight, and the Grand Bazaar is no different! 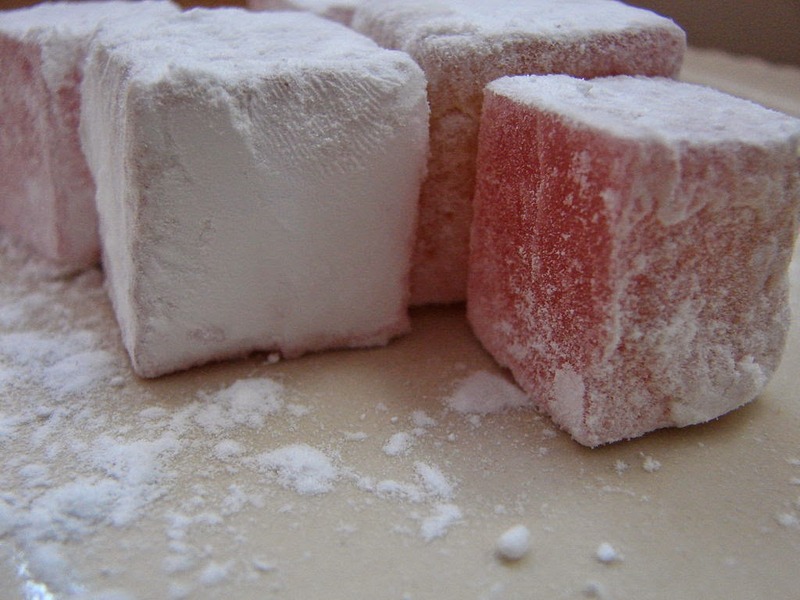 You cannot leave Turkey without having mouthfuls of the sweet Turkish delight… And without taking a pack back for folks at home! Middle Eastern spices: Cinnamon, turmeric, anise, cardamom… It’s all there, in gunny bags. Take some in your palm, sniff and let the smells tickle your brain. Obviously, go ahead and buy some! Dried fruits and Vegetables: Excellent quality hazelnuts, figs, raisins – the entire fanfare. Dried fruits in the bazar were much cheaper than even the wholesale shops in India! Yes – you get dried vegetables too – the most interesting one being dried eggplant. Tea and Coffee: After spending only a couple of hours in Turkey, you will realise that tea and coffee are inseparable parts of the Turkish culture. I am a tea person and was like a kid in a candyshop at the tea merchant’s shop – apple tea, rose tea, green tea…. Someone help me prioritize! Pastes and syrups: Tomato and pepper paste – makes everything yummy and soupy. This was my best buy from the bazar! Pomegranate syrup makes any salad dressing yummy – haven’t found it anywhere else besides Turkey. Olives galore: Green, black, kalamata… And other varieties. The shop owner will pack them for you in vacuum packs – they last for a year in the fridge. Needless to say, the olive oil is excellent too. Flavours: I picked up some rose water and some orange blossom water – happy with the purchase! Don’t rush: Come with some time at hand – a mere 1 hour is not enough at either of these bazaars, especially if you intend to shop. 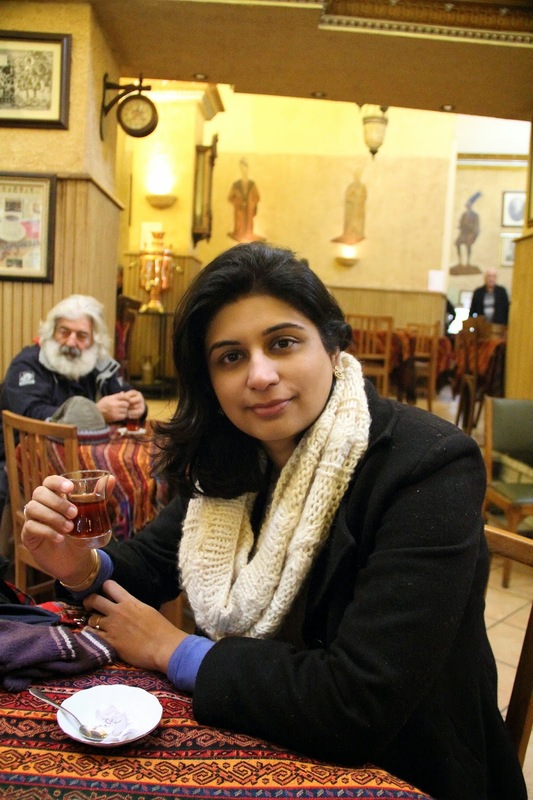 I spent over 3 hours at the Grand Bazaar and over 2 hours at the Spice Bazaar, including the much needed tea breaks. Recce time: Reconnaissance will help you be a smart shopper. Spend the first 30 minutes (at least) walking around the bazaar, looking through stuff and understand the price range. It will give you a sense of the prices. Fill your basket: Pick up all that you want to buy from a single shop and bargain for it together – will get you a better deal bargaining for the lot. If you bargain for one item and then go for the next – the shopkeeper would surely make a higher margin on the second one. I love my keds: The bazaars are buzzing with locals – real people who come to buy stuff for their daily needs. There are no supermodels walking around in designer wear. Dress comfortably and wear comfortable shoes. Don’t be shy: Bargain… it’s fun… the shop keepers expect that from you! Be a sport… and be reasonable… be nice to them… and they will make sure that you have fun as you shop! I am bad at this – Ankur does a better job and he recommends not buying at the first shop that you bargain at – you will get the hang of the ‘sport’ after a few attempts! 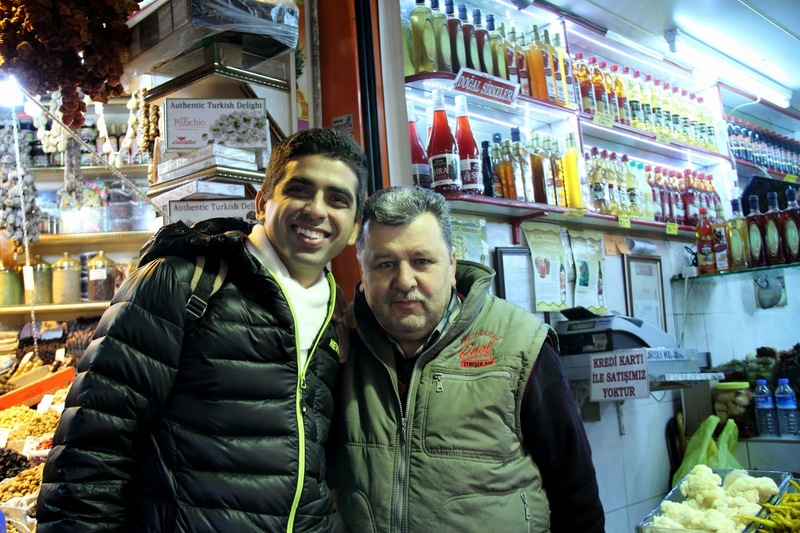 There is always some time for a cup of tea: The Turks are great hosts and the shopkeepers are glad to offer a cup of tea, if they are sipping one…or a piece of Turkish delight. You can always make time to sip some refreshing apple tea and chat with a local. Isn’t meeting people and understanding a culture the real essence of traveling? Grand Bazaar: Much needed tea break!